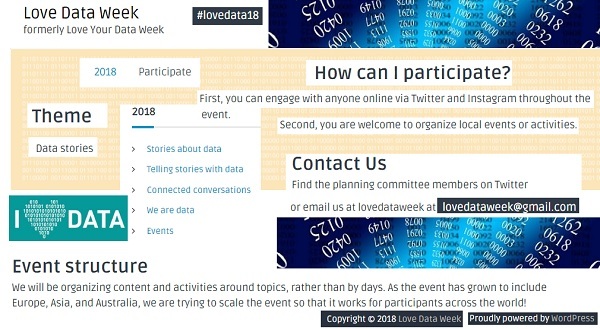 12 - 16 February 2018 : Get involved in LOVE YOUR DATA WEEK 2018 Events ! LOVE YOUR DATA WEEK 2018 : WHAT IS IT? Love Data Week is a social media event #lovedata2018 coordinated by research data specialists, mostly working in academic and research libraries or Data Archives or Centers. Love Data Week is primarily an online event, though some institutions may choose to have in-person events. The planning committee is gathering content and creating some great activities for you to engage with them online or coordinate events at your institution. Related ... OR ... Get Inspired ! 3 March 2018 : Open Data Day : You are invited ! 21 - 23 March 2018 : RDA Eleventh Plenary Meeting "From Data to Knowledge"
Make the best use of the Research4Life Resources… & MORE : Get involved ! 2018 IFLA World Library and Information Congress Participation GRANTS... & MORE about IFLA : Get Involved !